LPWAN offers multi-year battery lifetime and is designed for sensors and applications that need to send small amounts of data over long distances a few times per hour from varying environments. LoRa and LoraWAN belong to the category of non-cellular LPWAN wireless communication network protocols and players, operating in the license-free spectrum. 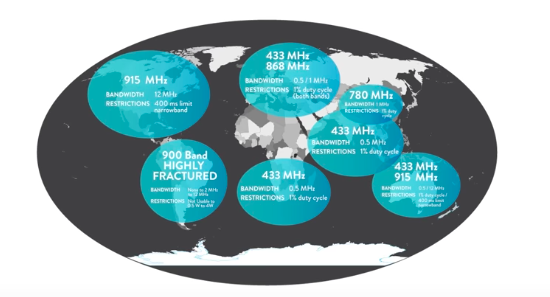 Other technologies that operate in the license-free frequency bands include Sigfox, Ingenu and several more. A complete list of Wireless IoT protocols may be found here. While LoRA, LoRaWAN operates on open licensed-free spectrums, others may operate on licensed frequencies. Accordingly, LPWANs may often be classified as licensed and licensed-free LPWAN ecosystems. 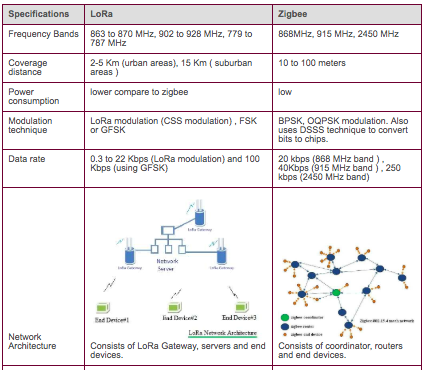 LoRa and Sigfox fall under non-cellular IoT technologies. NB-IoT (NarrowBand IoT) falls under cellular IoT category, and transmits over cellular frequency . Note: It is possible for LoRa(or any LP WAN device) to transmit over large distances with low power, since the laws of physics dictate, that in order to transmit over a large distance; you either need to increase the power, or reduce the bandwidth. Since LoRa embedded sensors transmit over large distances, but use low power (batteries), its bandwidth is greatly limited. What is LoRa and LoRaWAN (and Symphony Link) ? LoRa (Long Range) is a patented digital wireless data communication IoT technology developed by Cycleo of Grenoble, France. It was acquired by Semtech in 2012, which holds the IP for LoRa transmission methodology. LoRa transmits over license-free sub-gigahertz radio frequency bands like 169 MHz, 433 MHz, 868 MHz (Europe) and 915 MHz (North America). LoRa enables very-long-range transmissions (more than 10 km in rural areas) with low power consumption. The technology is presented in two parts — LoRa, the physical layer, and; the communication protocol built upon the underlying LoRa physical layer. The communication layer may be LoRaWAN (Long Range Wide Area Network), an open source communication protocol defined by the LoRa Alliance consortium; or may be Symphony Link, another open source communication protocol defined by a company called Link Labs. Thus, LoRaWAN™ defines the communication protocol and system architecture for the network, while the LoRa® physical layer enables the long-range communication link. LoRa WAN communication protocol ensures reliable communication, secure communication and adds additional headers to the data packets. The LoRaWAN communication protocol is defined by the LoRa Alliance, a non-profit technology alliance of more than 500 member companies, committed to enabling large scale deployment of Low Power Wide Area Networks (LPWAN) IoT through the development, and promotion of the LoRaWAN open standard. The first LoRaWAN standard was announced by the LoRa Alliance in June 2015. In 2017 LoRaWAN specification 1.1 was released. LoRa and LoRaWAN permit inexpensive, long-range connectivity for IoT devices in rural, remote and offshore industries. They are typically used in mining, natural resource management, renewable energy, transcontinental logistics, and supply chain management. LoRaWAN is the most adopted type of LPWAN, and promises ubiquitous connectivity in outdoor IoT applications, while keeping network structures, and management, simple. LoRaWAN network architecture is deployed in a star-of-stars topology (vs. mesh topology eg. Zibgee). The LoRaWAN networks laid out in a star-of-stars topology have base stations relaying the data between the sensor nodes and the network server. Communication between the sensor nodes and the base stations goes over the wireless channel utilizing the LoRa physical layer, whilst the connection between the gateways and the central server are handled over a backbone IP-based network. End Nodes transmit directly to all gateways within range, using LoRa. Gateways relay messages between end-devices and a central network server using IP. optionally a micro-controller (with on board Memory). The sensors may connect to the LoRa transponder chip, or the sensor may be an integrated unit with the LoRa transponder chip embedded. The LoRaWAN end nodes(sensors) typically use Low Power and are battery powered (Class A and Class B). LoRa embedded sensors that run on batteries that can typically last from 2–5 years. The LoRa sensors can transmit signals over distances from 1km — 10km. The LoRa sensors transmit data to the LoRa gateways. 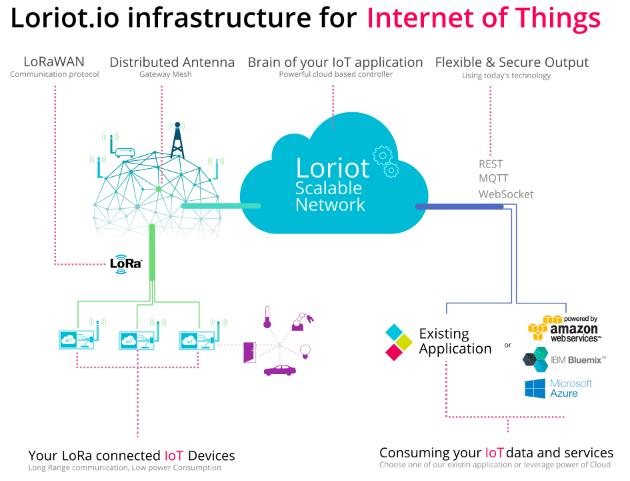 The LoRa gateways connect to the internet via the standard IP protocol and transmit the data received from the LoRa embedded sensors to the Internet i.e. a network, server or cloud. The Gateways devices are always connected to a power source. The Gateways connect to the network server via standard IP connections and act as a transparent bridge, simply converting RF packets to IP packets and vice versa. The Network servers can be cloud based platform solutions like The Things Network (TTN) or LoRIOT. The network servers connect to the gateways and de-dup data packets, and then routes it to the relevant application. The network servers can be used for both uplink (i.e. sensor to application) or downlink (i.e. application to sensor) communication. The Things Network Network server has a Router, Broker and Handler, which processes the data packets from the LoRaWAN gateway. It also has an AWS Bridge that connects TTN to the AWS IOT platform. The Application can typically be built over IoT platforms like AWS IoT using Lambda, DynamoDb or S3 services. Part III has more on the end-to-end connectivity and TTN and Overall IoT Architecture. Security is a primary concern for any mass IoT deployment and extremely important for any LPWAN. LoRaWAN™ utilizes two layers of security: one for the network and one for the application. The network security ensures authenticity of the node in the network while the application layer of security ensures the network operator does not have access to the end user’s application data. Data over LoRaWAN is encrypted twice; sensor data is encrypted by the node, and then it is encrypted again by the LoRaWAN protocol; only then is it sent to the LoRa Gateway. The Gateway sends data over normal IP network to the network server. The Network server has the Network Session Keys (NwkSkey), and decrypts the LoRaWAN data. It then passes the data to the Application server which decrypts the sensor data, using the Application Session Key (AppSKey). This is important since LoRa Gateway operate over open frequency so can receive data from any sensor in the vicinity. Thus, it become important that the LoRa Gateways not have ability to decrypt sensor data. It is important to note that it is the LoRaWAN communication protocol that adds the encryption. LoRa transmissions by themselves are simple radio wave transmission and cannot be encrypted. LoRaWAN™ devices have two ways to join the network. The first is OTAA, Over-the-Air-Activation. The device and the network exchange a 128-bit AppKey. When the device send the join request, the AppKey is used to create a Message Integrity Code (MIC), the server then check the MIC with the AppKey. If the check is valid, the server creates two new 128-bit keys, the App Session key (AppSkey) and the Network Session Key (NwkSkey). These keys are sent back to the device using the AppKey as an encryption key. When the keys are received the device decrypts and installs the two session keys. The NwkSkey is used to guarantee the message integrity from the device to the LoRa Network Server. The AppSkey is used for the end-to-end AES-128 encryption from the device to the Application Server. The second method for the network join is ABP, Activation by Personalization. In this case the device session keys are inserted by the user, thus is possible to have security issues. LoRa devices transmit in open frequency range which do not require a government license to transmit on. i.e. LoRa operates in license free frequency bands and one does not need license from government or state, to transmit on these frequencies. However it is important to note that the free or unlicensed frequencies vary from continent to continent. It is extremely important to configure the LoRa transponder chip to transmit on the correct frequency depending on the location. Failure to comply can incur hefty fines and penalties from the local governments of the countries. LoRaWAN data is transmitted in digital format in the form of bytes. The practical limit for reliable transmissions of data payloads in varying conditions is 100 bytes. While it is possible to go slightly above, 100 bytes maximum is a good working rule. LoRaWAN networks have been tested with success, with 100 byte messages sent every 7 seconds over an extended period. However, in practice, anything more frequent than transmitting once a minute is not recommended. It is possible for a single gateway to handle thousands of LoRa nodes simultaneously. LoRaWAN has the benefit of being an alliance with an Open approach instead of a proprietary one (SigFox). Low bandwith makes it ideal for practical IoT deployments with less data and/or with data transmissions which aren’t constant. Security: a layer of security for the network and one for the application with AES encryption. Backed by the likes of CISCO, IBM and 500 other member companies of the LoRa Alliance. Not for large data payloads, payload limited to 100 bytes. Not for continuous monitoring (except Class C devices). Not ideal candidate for real time applications requiring lower latency and bounded jitter requirements. Densification of LoRaWAN networks: The proliferation of LPWAN technologies, and particularly LoRaWAN, poses co-existence challenges as the deployment of gateways populate urban areas. Disadvantage of open frequency is that you may get interference on that frequency and the data rate may be low. (For GSM or licensed frequency you can transmit on that frequency without any interference. GSM operators that use certain frequencies pay a large licensing fee to the government for the use of those frequencies. LoRa operates on frequencies that are open and do not need a state license. Keep in mind though that the open frequencies are different from country to country). Both LoRaWAN and Sigfox provide wireless data connectivity for the long range, low power segment. 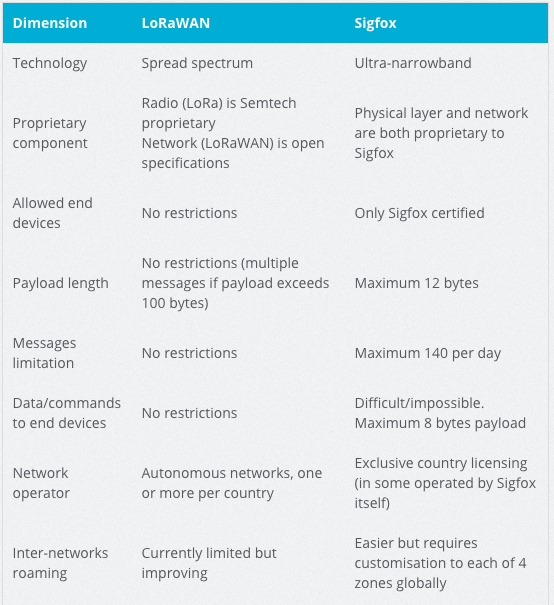 However, LoRaWAN and Sigfox are very different technologies and business models. The table below highlights some of these. NB-IoT works on a cellular, licensed spectrum, the devices have to be synced with the network at regular (and relatively frequent) intervals. 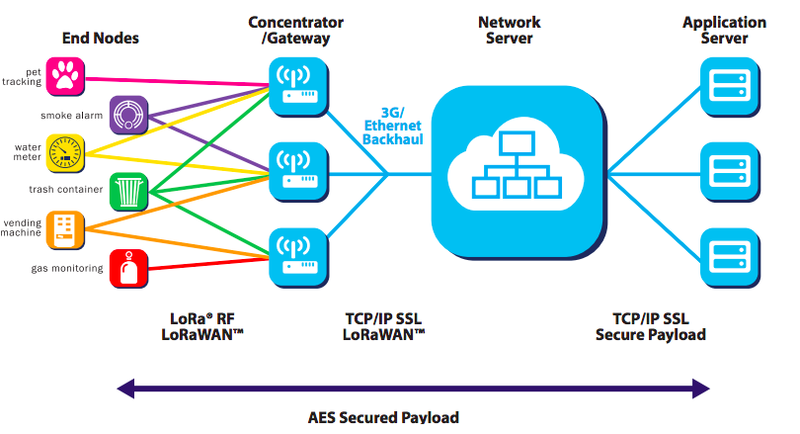 No such network synchronization is required in the ALOHA-based LoRa architecture. The LoRa IoT technology works on license free radio frequency spectrum (Sigfox does the same). Accordingly, applications powered by LoRaWAN have minimal costs and battery performance receives a boost. NB-IoT services are synchronized and they are provided over licensed frequency bands, the costs for frequency band licensing is significant — with the per-MHz cost being >$500. Telecom operators have the option of deploying NB-IoT in guard bands, in 4G LTE spectrums, and of course, in a standalone network. Both LoRa and NB-IoT provide coverage in the 10 km–15 km range. However, NB-IoT works best in sophisticated urban locations, and its performance is not up to the mark in suburban or rural areas (practically any place that does not have strong, glitch-free 4G coverage). Since LoRaWAN does not rely on cellular data or wifi for functioning, its coverage remains relatively steady across all types of locations. Because NB-IoT is a cellular-grade wireless technology the chips are more complex. That means users get the high performance level associated with cellular connections, but at the cost of more complexity and greater power consumption. ZigBee is a wireless 2.4 GHz standard built on IEEE 802.15.4. There are many different application profile stacks you can run on top of it — and because it is governed by a standards body, it can interoperate across multiple manufacturers. ZigBee is a mesh network, so each node in a ZigBee system can act as a wireless data endpoint or a repeater. Data travels from node to node until it reaches the router. It is designed for relatively low data-rate applications, and it is regularly used for home automation and smart lighting. 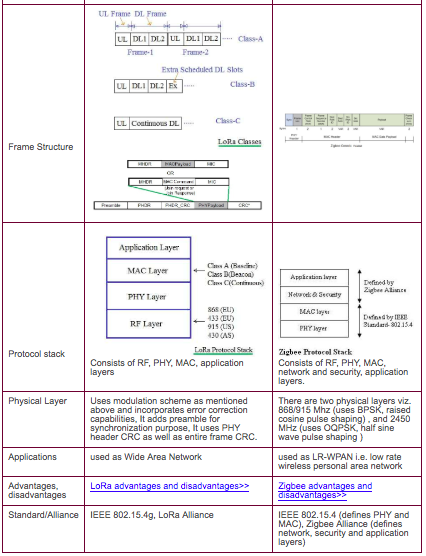 Comparison of Zigbee Mesh Network Architecture vs. LoRaWAN star-on-star network architecture? LoRaWAN uses a star topology and Zigbee uses mesh topology. In a mesh network, the individual end-nodes forward the information of other nodes to increase the communication range and cell size of the network. While this increases the range, it also adds complexity, reduces network capacity, and reduces battery lifetime as nodes receive and forward information from other nodes that is likely irrelevant for them. For long range, star architecture makes the most sense for preserving battery lifetime when long-range connectivity can be achieved. Are LoRa and LoRaWAN better than other technologies (NB-IoT, Sigfox, etc.)? LoRaWAN has the benefit of being an alliance with an Open approach instead of a proprietary one. Is LoRa and LoRaWAN backed by any consortium or major company? LoRaWAN and LoRa is backed by LoRa Alliance, a non-profit and one of the fastest growing technology alliance of more than 500 member companies(as of 2018), committed to enabling large scale deployment of Low Power Wide Area Networks (LPWAN) IoT through the development and promotion of the LoRaWAN open standard. LoRa and LoRaWAN adoption trajectory in the IoT space? LoRaWAN networks, using the LoRaWAN protocol, are offered by over 70 network operators and there are LoRaWAN IoT deployments in more than 100 countries (private ones included). LoRa and LoRAWAN, has become the main non-cellular LPWAN ecosystems and solutions. It has a strong ecosystems of hardware vendors, developers, partners, IoT platforms, system integrators, IoT technology/solution vendors and telecommunication providers. LoRaWAN and LoRa are already widely available in several European countries, Asia-Pacific, Australia, and the US. On June 30th, 2016, The Netherlands became the first country in the world to have a nationwide LoRa network for Internet of Things applications. LORIOT.io, has developed a LoRaWan cloud, and is present in over 70 countries, including Rusia, China, a large part of South America and several African countries. Following research papers were studied to understand the limits of LoRaWAN and study its suitability in an indoor high obstruction environment. This study investigates the indoor performance of LoRa, by the means of empirical measurements. The measurements were conducted using the commercially available devices in the main campus of the University of Oulu, Finland. The study effectively proves that the indoor (obstruction) communication links of over 300 meters are possible with LoRa and LoRaWAN. The results in the following study showed very good performance of LoRaWAN for indoor industrial monitoring systems, in terms of reliability, timeliness, and energy consumption. This article is aimed to clarify the scope of LoRaWAN by exploring the limits of the technology, matching them to application use cases and stating the open research challenges. This paper provides a comprehensive and comparative study of different LPWAN technologies, which serve as efficient solutions to connect smart, autonomous, and heterogeneous devices. LoRaWAN should be used only when we do not want to detect rapid changes. eg. occupation of a parking space, or humidity changes in plants. If the transition is limited to tracking change every min, then LoRa devices are fine. Real Time Monitoring Agriculture, leak detection or environment control with a reduced number of periodic/aperiodic messages and relaxed delay constraints. Smart City Applications LoRaWAN has shown key success stories with smart lighting, smart parking and smart waste collection thanks to their scale and the nature of the data generated by those applications. These encompass periodic messaging with certain delay tolerance. For example, smart parking applications report the status of the parking spots upon a change is detected [. Parking events are slow and therefore network signaling is limited to few tens of messages per day. Analogously smart waste collection systems and smart lighting actuate or report information in response to a measure with large variation periods. Although latency and jitter are not major issues in these applications, in some of them the triggering factor is simultaneous for a huge number of end-devices. For instance, sunset and down trigger the lighting elements around the whole city, thereby causing an avalanche of messages. LoRaWAN is an appropriate technology for this use case since it handles the wide coverage area and the significant number of users at the expense of increasing number of collisions, latency and jitter. Challenge in Fall Detection Use Case: Fall-Detection use case is difficult to detect since the fall detection algorithms are not well developed, and lead to several cases of false positives and also missed falls. Geolocation of end-devices: The location of end-devices is a mandatory requirement for specific use cases. However, GPS-based solutions are not feasible due to cost, and CPU and energy consumption. Currently, interesting works have been initiated to develop TDOA-based (Time Difference Of Arrival) triangulation techniques for LoRaWAN. It has been shown that this approach benefits from large SFs and dense gateway deployments. Continuous Monitoring: Industrial automation, critical infrastructure monitoring and actuation require some sort of real time operation. 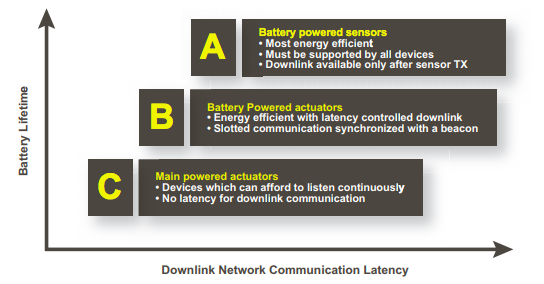 Real time is understood in general by low latency, and bounded jitter and depends on the specific application. LoRaWAN technology cannot claim to be a candidate solution for industrial automation. LoRaWAN, deterministic operation cannot be guaranteed despite of application specific periodicity as ALOHA access is subject to contention which impacts network jitter. Despite that, small LoRaWAN networks can deliver proper service to applications that require, for instance, sampling data every second. From an Alliance perspective the LoRaWAN communication protocol built on LoRa is open source. Micro controller suppliers Microchip, ST Microelectronics and Renesas have publicly announced intentions to adopt LoRa radio technology. There will also likely be other semiconductor companies offering solutions in the near future. LoRa Node devices are end node devices to which the sensors connect. Nodes are slave devices that initiate communication with LoRa gateway. LoPy and LORA GPS Hat are the most common used LoRa Devices. LoPy is the most popular and common LoRa Node. LoPy can connect to sensors, receive data store on flash if required and send via LoRa signal to the LoRa gateway. programmable in micro Python. Ensure that you use the correct frequency setting in the correct country. 868 Mhz in Europe and 915 Mhz in the US (this is an important legal consideration). Cost is $20–25. LoRa GPS Hat can be used as both Node/Gateway. LoRaWAN Node Devices are defined into 3 Classes, in order to conserve battery life. Class A: Sensors are battery powered and they sleep most of the time, i.e. device is not doing must most of the time. Class A devices transmit data and then wake up after a receive delay period to receive data. This means that the acknowledgement for the data transmitted by Class A devices must come immediately. Battery life for Class A devices is typically 2–5 years. Class B: Battery powered sensors, the sleep is controlled by the network, and network can instruct the device when to sleep when to wake up. This is new and not many devices in this Class. Class C: Always connected to the power source, always awake. LoRa Gateway are connected to power source (not on battery), receive data from LoRa sensors, and sends over IP to the server. LoRa Gateways cost around $1000 — $2000 for industrial strength Gateways. DIY gateways like IMST IC880-SPI. The following is an array of certified products available now to fulfill the wide ranging spectrum of IoT use cases served by LoRaWAN. Designed to facilitate beginners and developers to quickly learn LoRa and IoT technology. LoRa IoT kit will show how to build LoRa network, and how to use the network to send data from a LoRa sensor node to various IoT servers. When used as a private LoRa network, the LoRa gateway will connect your other LoRa nodes up to 5km — 10km. 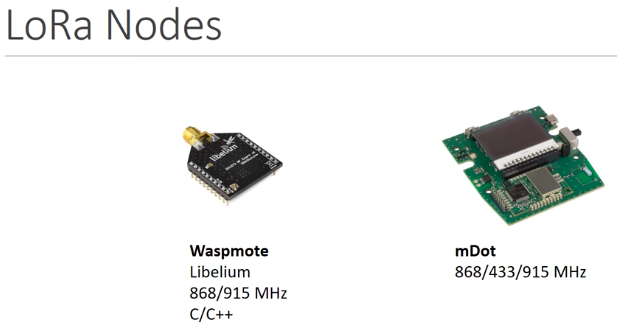 The LoRa IoT Starter Kit — 868 MHz allows the user to send data and reach extremely long ranges at low data-rates with Waspmote. The development software kit includes LoRa® gateway utility, Arduino node library and sample code. The LoRa® Starter Kit offers makers/ developers a convenient platform to quicky demonstrate the long range and low power cunsumption capabilities with LoRa technology. In Part I we focused on the LoRa and LoRa technology. In Part II we focused on the LoRaWAN hardware. In Part III we will focus on the end-to-end ecosystem and how to setup a complete IoT ecosystem using LoRAWAN. 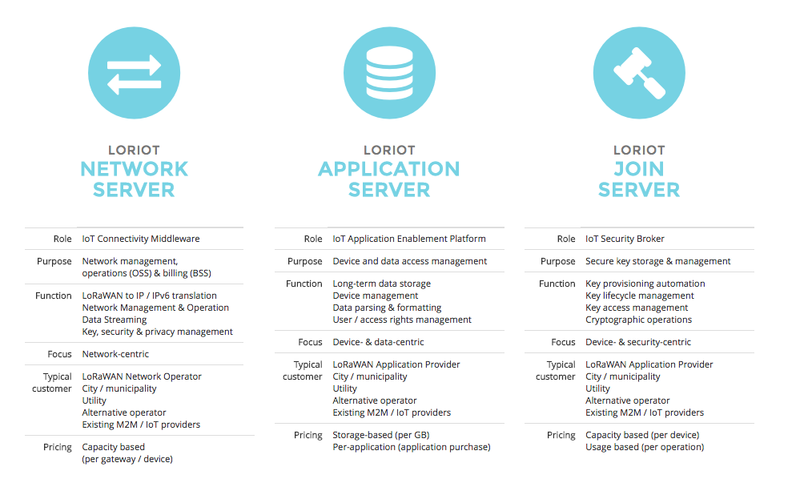 The LoRaWAN ecosystem consists of four main components. The End Nodes, i.e the sensors connected to the LoRa transponsers. These are battery powered and can transmit over 5km — 10km range. Batteries can last from 2–5 years depending on usage. The Gateway, that receives data from the end node sensors. These are powered devices that are usually plugged into a power supply. The Gateway receives the LoRa data packets over LoRa and then forwards the data packets over Internet Protocol (IP) to the network server. A single Gateway can receive data from thousands of sensors. The Network Server, which receives the data packets (in bytes) from the Gateway and then processes it and forwards it to the Application Server. The Network server will be a the main focus of Part III. The Network server is typically a hosted solution on the Cloud eg. The Things Network (TTN), or the LoR-IOT Cloud. It may alternatively also be an on-premise deployment eg. https://www.resiot.io/en/. The Application Server, this is where the application which does “something” with the data received from the sensors is present. The Application server may be on a cloud infrastructure solution like the AWS IoT or Azure. The application may be built using AWS services like Lambda, and may use S3 or DynamoDB. This is where you build your IoT applications or dashboards etc. LORIOT is a software provider and network operator of LoRaWAN Networks. Their core product is software for scalable, distributed, resilient operation of LoRaWAN networks and end-to-end applications, which they offer under a variety of business models. Typical customers are small and medium enterprises in the Internet of Things business, cities, municipalities and wireless network operators. Follow me on Medium for related articles and the latest updates!